As almost everyone knows, old Italian violins – especially Strads, Guarneris, and Guadagninis - are priced at far more than their weight in gold. Their prices are now set so high hardly any artist can afford them. In the old days, it was not unusual for someone in the nobility or a wealthy patron to gift a valuable instrument to a violinist. Such a thing happened to Nicolo Paganini, Teresa Milanollo, and a host of other violinists. 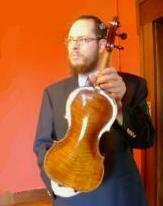 Nowadays, pricy violins are owned by philanthropic foundations, banks, investors, or private collectors. They usually lend their instruments out to worthy players – most of them young. However, players are beginning to realize that many new instruments are as good as old ones – even the very best Strads – and the new ones can be purchased for less than two percent of the price of an old one. That’s right, two percent. During the time he owned it, Menuhin would take his (1934) replica of his Strad (the Khevenhuller - 1733) to concerts where he thought the original might be in danger. Nobody knew. Obviously, the sound did not give it away. That tells you something. Outstanding modern makers such as Sergio Peresson, Douglas Cox, David Burgess, Joseph Curtin, Greg Alf, Michael Darnton, David Gusset, Mario Miralles, Gregory Sapp, and quite a few others have constructed stupendous violins which have been praised by some of the world’s top violinists. These violins are priced between ten and forty thousand dollars. It has been stated that it can take a violin anywhere between six months to seventy five years to open up (though that, of course, is highly debatable.) My own replica of Paganini’s famous Cannone was constructed by Daniel Houck from Ohio. It is my second violin from Houck. Since I am not a concert violinist with a sizable budget, I partly based my decision to commission Mr. Houck on price comparisons. Houck’s price cannot be beat because he is at the beginning of his career as a maker. The violin itself, which was completed just three weeks ago, is a wonderful instrument – it does everything a good violin should: it’s extremely responsive, clear, powerful, warm in quality, and even in tone across all strings. What more can anyone ask? The rest is entirely up to my bow arm. The laws of physics cannot be circumvented. Strads and Guarneris can only last so long. In 100 years, modern violins will make old ones - even Strads - obsolete, especially since old violins are being over-played. The old ones may retain some value but only as fabulous antiques. Hey! Could you tell me a bit more about the violins he made for you? Do you still use them?